As an animal lover, and now an advocate for animal rights, I’ve always been interested in the peaceful protest and street activism. However, as an introvert, that is not a place where I am comfortable.&nbsp; Yet I’d like to share a group called Anonymous for the Voiceless. Hello everyone, so as an animal lover and now an advocate for animal rights, I’ve always been interested in the peaceful protest and the street activism on behalf of animals. However, as an introvert, that is not a place where I am comfortable participating in street activism, but I’d like to share with you a group called Anonymous for the Voiceless – and you may find them on social media. In November, a few months ago, I went downtown Orlando and photographed the folks there, they had a Cube of Truth with about 22 people. And what’s fascinating about this is that they have laptops or tablets and they stand there quietly, peacefully, lined up in a cube, kind of back to back in a square. And they allow passersby to get curious about what’s going on. And the folks in the cubes don’t talk. They have masks on, because it’s not about the advocates. It’s about the message. It’s about the animals. They will, however, have a spokesperson on every corner of the cube so that if I’m passing by and I go, what’s going on here? What is this all about? The spokesperson will say, well, you may watch this video if you’d like. It’s local standard practice footage of animals in factory farms or slaughterhouses, and this is the truth. This is actual video that’s hidden from the public, but we’re here to educate you on what really happens to the animals that become our breakfast, lunch and dinner. The passersby may stand there and ask questions if they like or they may move on and go about their day. 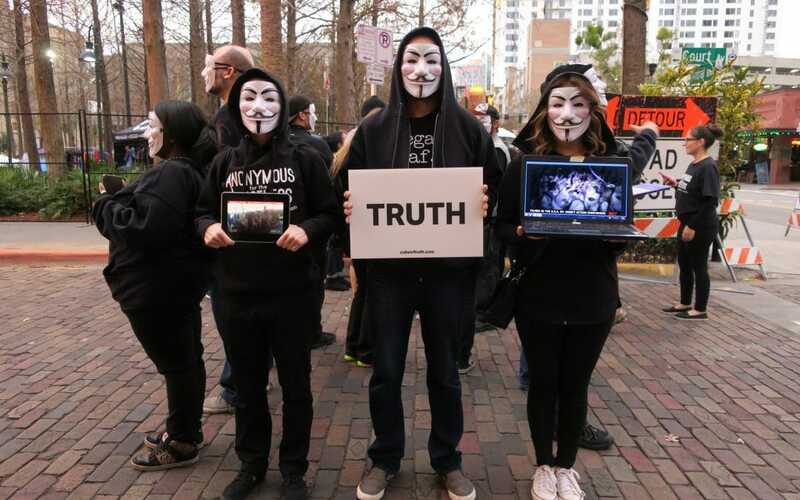 In November, the Anonymous for the Voiceless organization was holding a world global event. They had over 491 Cubes of Truth demonstrations operating around the world. That was November third, 2018, and according to their social media, they tallied over 22,000 passersby who stopped and watched the video and ask questions. This was worldwide. This was Orlando, Florida, the UK, Norway, Spain, Guatemala, Germany, Vietnam, Austria, Serbia, Colombia, down in South America. This was everywhere, so I felt like I wanted to be a part of it. I wanted to witness this. I took my recorder and I went down, and I spoke with JOE and ANNETTE who were two of the spokespeople that were standing to the side answering questions of passersby. The following field recording is my conversation with JOE and ANNETTE. And I think you’ll find it very interesting. It’s on Orange Avenue in Orlando, which is downtown. It’s on a Saturday night. It’s busy traffic, so you will hear noise. You won’t hear any noise from the Cube of Truth, except for citizens walking by and wanting to know what’s going on and perhaps asking more questions. JOE: What is, um, so you run your own podcast, yeah? DEE: And my podcast and my blog is The Introverted Advocate. DEE: So, I advocate for three groups: People with disabilities, animals and plant-based living. DEE: So, so I understand around the world in 66 countries you’ve got like over 500 of these demonstrations, the Cube of Truth tonight; is that right? JOE: Yeah. 500 globally, yes. JOE: — earlier on in the day. JOE: — on this day and now just a year later, there’s 500 chapters that are running cubes today so that’s, I don’t know what the percentage is on the growth with that, but it’s a pretty massive growth percentage. JOE: In a short year. ANNETTE: It really, really is. DEE: It’s awesome. So how long have you been involved — are you involved also with this? DEE: How long have y’all been involved with the Cube of Truth? ANNETTE: Um, I started activism about a year and a half ago. ANNETTE: I’ve been vegan three years. DEE: Myself…about five years vegan. DEE: — um, but I was a little late to the party going vegan. But, that’s okay. How about you? JOE: I’ve been vegan now for six months. So it’s veg for about a year and a half before that. DEE: So you really jumped in, yeah. JOE: — helping yourself and helping your own health by going vegan. So now I wanted to do more activism work. JOE: So I do AV Orlando and then I just started doing speaking engagements as well, which I enjoy. DEE: Oh, good for you. JOE: And you know, whatever I can do, wherever I can do it, I try. JOE: — kind of the way to go. DEE: It seems like Orlando has really picked up momentum with the vegan community. Do you agree? ANNETTE: — restaurants are, um, adding the Beyond Burgers, The Impossible Burgers. Like little small, there’s a little small Cuban restaurant here in downtown, it’s like a little hole in the wall. ANNETTE: And they have the Impossible burger. ANNETTE: So I mean, more and more places in Orlando are just becoming more and more vegan friendly. JOE: — their advertisements. So in their weekly ad, there’s a whole page on plant-based eating and vegan food products, including buy one get one for the Beyond Burger that Publix was selling. DEE: Well, I did see Kayla posted that she had like a basket full of the Beyond burgers buy one get one free. DEE: And they’re like, did you leave any for us? I think that’s a good problem to have. ANNETTE: Yes. Definitely is, I agree. DEE: The supermarkets see that that stuff is flying off the shelves. DEE: We don’t care what the name of it is, let’s just bring more in. DEE: And then the word gets out. JOE: Yeah, it’s supply demand too, right? JOE: So much more demand for it so the grocery stores are answering the demand. The public has really got a really high demand for it. JOE: And I think Orlando is going to be a real hot bed for growth in veganism around the area. It’s going to be a city of leadership, I think, for the vegan movement. JOE: And so it’s a very exciting place to be. JOE: While this thing starts getting a lot of momentum going. DEE: So this Cube of Truth takes place tonight for a couple of hours. DEE: And passersby will see the video that you’re playing on these laptops and tablets, right? DEE: And then they’ll just stop if they wish or they can just keep on walking if they wish. JOE: We don’t go after people. We want to wait until they engage and wait until they start watching and after they’ve watched a little bit, then we’ll go and ask them if they’ve seen footage like this and we engage in a conversation. They usually start with questions. JOE: Yeah. So we want to be inviting. As inviting as possible. DEE: Right. Right. But not intrusive. DEE: So it’s, it’s not a — it’s not an in-your-face, in-your-face sort of event. ANNETTE: No. Not necessarily. Because you make the choice. You can choose to walk by and watch the footage and engage with us or you can choose just to walk by. But like he said, we’re not going to get in peoples’ faces if we don’t, you know, we’re not — if they’re not interested. ANNETTE: We just let them come to us and it’s better when they come to you because then they’re more open to listening to you, getting in a conversation with you and even more receptive with the information you give them. Because they’re curious to find out what it is that you’re presenting. ANNETTE: — rude and we don’t want to do that. It’s a very peaceful event. And it’s, like he said, just to get people in engaged and when they come over, then that’s when we go ahead and have the conversations. DEE: Do you ever have anyone who’s skeptical that that is real footage? ANNETTE: Personally, I haven’t. But I have heard people say, I don’t know if that’s real and things of that nature. But for the most part, I haven’t experienced it. JOE: No. I haven’t, either. I haven’t had anyone say they don’t think the footage is real. JOE: Now, people do say a lot of other things or you know, what would be excuses for being vegan. JOE: I think what you learn when you’re doing activism are ways to raise other questions to kind of get them thinking about those claims that they’re making. JOE: And, you know, a lot of times it can be a very productive conversation if it’s leveled that way. If it’s shown as this invitation to have a conversation. DEE: Right. Right. Well, I’m a new advocate for vegan and animals. At the VegFest of Central Florida in 2015, I talked to a gentleman at the Vegan Outreach booth. And I said, I want to go public as a vegan. I want to now speak up. DEE: I don’t want to just keep it to myself. DEE: And I said, but I am so scared because I have no clue what — how to get started. DEE: And he said, just be yourself. DEE: Nice. So, my website and my podcast, my mission is to help new advocates, okay? Now, this is even advocates if they have a sick child. How to learn to advocate. So, across the board, not just for animals or vegan. What advice would you offer someone who wants to, to be an advocate, to speak up for a person or a community or a cause, to get started? Any, any suggestions? ANNETTE: Yeah. I think for me, um, the easiest way that started for me was social media. ANNETTE: — Instagram, make them public. ANNETTE: — find you and see what it is that you’re sharing. ANNETTE: So — and then follow a lot of different pages, Save Movement, AV (Anonymous for the Voiceless), Toronto Pig Save, all these different, whatever it is that you’re advocating for, so that you can share their posts. ANNETTE: — and you’re advocating for the animals, you’re doing activism and you don’t have to put yourself in an uncomfortable situation. If you’re not comfortable with talking to people. Eventually, um, I think when you do that, you start building up the nerves and you start learning more and then you actually say, you know what? Today’s the day that I’m going to talk to someone. ANNETTE: But I think that’s a great way to start. DEE: That’s good advice and this is the first time I’ve shown up at any live event to interview folks on the spot. So, it’s taken me a couple of years. DEE: But you’re right, to get up my nerve. DEE: But you’re right. I started with social media also. DEE: And that was my way, I’m going back to the point I made a minute ago was, learning about the cause. DEE: Which is, you know, animal welfare and stopping the suffering of all animals. DEE: So you’re right. That’s primarily where I learned all of my information. DEE: Nice, nice job. How about you? JOE: I would say to add to what she said is to know there’s a variety of ways to do activism and you can cook amazing vegan food and be an activist by showing people that the food is delicious. You can support animal sanctuaries. You can do just such a range of things. So, I think that finding what is suitable for your own heart, for what’s suitable for the way that you want to do activism is the way to go. And I’d say the other thing is, to ultimately, um, go in with the idea that every failure you have when you’re trying activism, is an opportunity to learning it better and, um, when you take that sense that this is an opportunity to learn, you’re not locking yourself up thinking that you have to be amazing when you first get started, you know. So, I think the fear that’s there is probably well placed because we, we want to do well a lot of times. And the fear part is there. I think a lot of times the way to kind of get rid of fear is through gratitude. So, I think that, you know, fear can’t hold the same space as gratitude in the emotional body. So if you bring gratitude into your life and gratefulness for the health that you have, and the fact that you’re already vegan and already living a really good life, you bring that into your, into your heart as you’re doing whatever activism thing that you’re trying to do that’s new, and you’ll find that it will be much easier to go in with your own truth and let that truth shine. DEE: Yeah. That’s awesome. You guys are great. DEE: You guys are great. This is wonderful, thank you. JOE: Yeah. Yeah. Well, thanks so much for coming out. We really appreciate. JOE: There’s a whole group of people that have been vegan for a while or just even turned vegan and want to do more and I think the work you’re doing with the podcast is fantastic for helping to encourage and, and bring people on in saying, hey, you can do this and even if you fall on your face 10 times, you can get up 11 times. JOE: And do better the next time. So that’s the, that’s the way to go. DEE: That’s, that’s very good advice. And, um, may I get your first names? DEE: ANNETTE. Okay. And I’m Dee. ANNETTE: Nice to meet you, Dee. JOE: Thanks, Dee. It was really nice.